Craigslist is a tricky place. Some people seem honest about a vehicle’s condition, others seem to be typing up things that are just too good to be true. But rarely are Craigslist car ads so captivating, and so truthful, that you’ll sit through 11 paragraphs of someone’s misery without getting bored. This was one of them. It all started when a poor soul fulfilled his lifelong dream of buying a Maserati, and chose to do so with a 2004 Maserati Coupe. It then became his personal “chariot to Hell (or bankruptcy),” as he likes to call it, which he can’t even say nice things about in an attempt to sell it as a $16,000 Italian paperweight. Some Jalopnik editor, somewhere, just popped a blood vessel because their internal radar senses that I did indeed publish a giant, never-ending block quote on this fine website. But I cannot make this Craigslist ad any better by adding my own commentary, and I will not do it the disrespect of trying. Don’t need a 16k Paperweight? Of course you don’t! 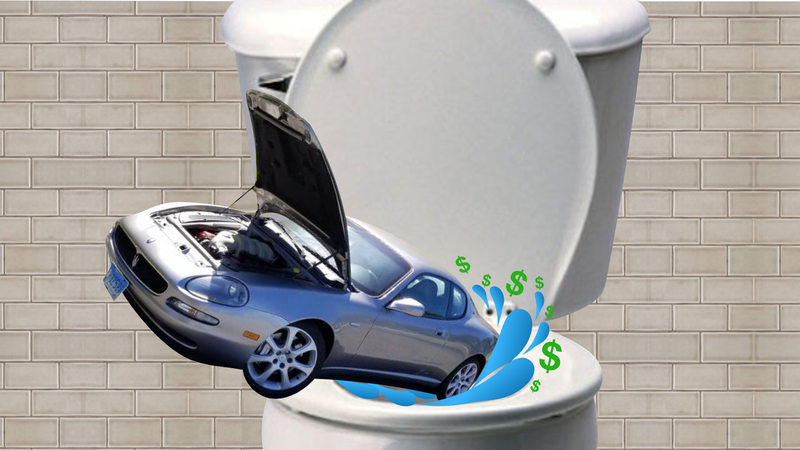 How about an Italian money toilet! Some of you may recognize this as a 2004 Maserati Coupe’ (also known as the 4200 GT). Don’t let that gorgeous Italian body fool you though, this car is Satan’s chariot to Hell (or bankruptcy). I do not exaggerate when I say that this car has been in the shop HALF the time I have owned it. In the last 6 months, I have put ELEVEN THOUSAND DOLLARS into it in parts and labor and the thing still isn’t right. I’m not rich. I’m just an average dude that always wanted a Maserati. Since I was a kid I lusted after those Italian curves and exhaust note. Now my own kids come to me and ask me why there’s no food to eat and the electricity has been turned off and I have to tell them it’s because Daddy’s car is sick again. This car has a new clutch, new clutch actuator, position sensor, F1 pump and relay, gear selector switch (a 2k SWITCH) new tie rods and new tires. It has the miraculous F1 transmission. As in if it works, it is a miracle. It is also seemingly inhabited by evil spirits. The voodoo priests at the Maserati dealer insist it’s fixed. But it’s not. And I’ve seen their facility. There’s no tools, just an altar to Alejandro DeTomaso where they place the still beating hearts and smoking wallets of Maserati owners and ask for a vision of what the @#$$ is wrong with their clients’ cars. Come take a look at it! It’s Beautiful! It WILL let you down. You might think that since I poured so much money into it, that there must just be one more thing and then it will be perfect. You can drive it home and laugh at the poor slob that you bought it from who did all the work for you. Nope. Not gonna happen. This car will make you cry. So why am I asking 16 grand for it? Good question. I’m taking a HUGE loss at that price and that’s the lowest price I can let it go for and still be able to pay my mortgage. If that’s too much, don’t buy it. I don’t blame you. Come look at it! Bring a witch doctor and maybe, just maybe, if the stars are aligned just right you can drive it. DO NOT DRIVE IT. If you drive it, you will want it. It is fast. It is beautiful. It makes a sound like angels revving their angelmobiles. I want this thing out of my sight. I’m tired of sitting in it at night drinking and making engine noises with my mouth while I pretend it is not a huge pile of disappointment and debt. Do not offer me 5k for it. The Trident badge alone makes it worth more than that. I don’t have to sell it. It can sit in my garage and I can continue to hate it. I don’t HAVE to sell it. I WANT to. There’s a difference. Just think: You’re only $16,000 away from wondering if your electricity will get cut off again, too.